Trend Micro Internet Security Pro safeguards your online transactions, identity, and irreplaceable files with the most comprehensive protection available. Get all the benefits of our proven Internet security plus enhanced identity theft protection, Wi-Fi validation, data theft protection, and system recovery. 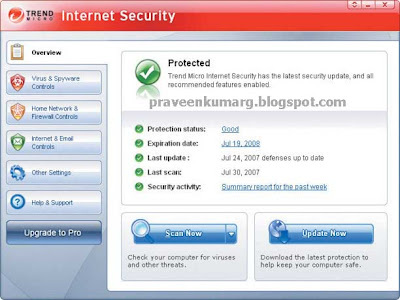 Trend Micro Internet Security 2008 makes it easy to protect your home network, personal identity, and online activity. It guards against present viruses, spyware, and identity theft as well as the web threats of tomorrow. Confidently e-mail, shop, bank, or share photos online, knowing your privacy and files are well protected.